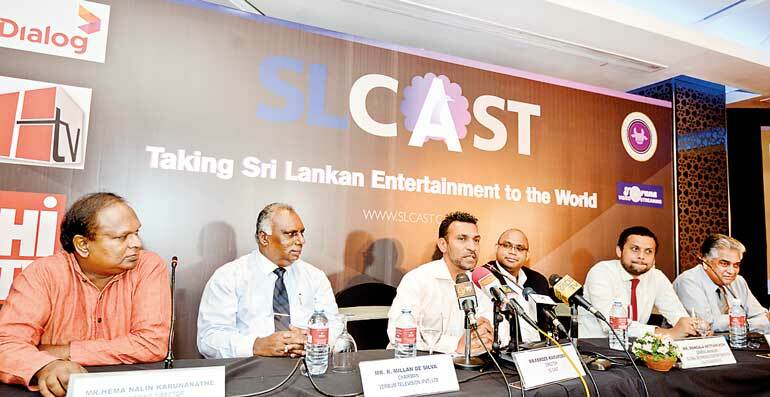 Leading entertainment industry service providers hope to tackle issues such as piracy of content and copyright infringement with the launch of SL Cast, an online streaming service exclusively dedicated to popular Sri Lankan shows. Hopes are high that this new service will enable the industry to tackle the serious issue of piracy as indicated by the points raised by a panel of representatives from various content providers that will be contributing to this new service. One source of this copyright infringement, according to them, comes from the illegal viewing by expatriates who have few other options to access beloved local shows and music videos. Therefore this new service will give them an opportunity to legally access such shows through an array of platforms such as RokuTV, Samsung Smart Hub, Apple iOS, Android or Android Smart Hub. Content creators and artists will be able to collect revenue for their creations while viewers will be rewarded with high quality content that cannot be matched by shows downloaded through illegal means such as by torrents. The content is made available through an app and viewers can set up an account and gain access to channels or individual shows according to their preference at www.slcast.com. The cost of channels will depend on the content provider but can be placed in the Rs. 350-500 range. Some programs can be accessed by activating individual channels on a monthly payment basis while there will also be some content that can be accessed on a pay-per-view basis. Service providers such as Dialog TV have taken part in this project in order to take local television shows overseas by giving expatriates access to “three channels that we are extremely proud of”, according to Dialog Axiata Plc General Manager Global Business and Content Services, Mangala Hettiarachchi. Torana will also create some exclusive content such as footage of concerts that viewers can gain access to through SL Cast before they are released on DVD. This will further encourage users to utilise this service as an alternative to illegal downloads. Similarly, channels like Arsik Entertainment are on board to provide access to the highly demanded Pusswedilla shows on a pay per view basis. As Kamardeen pointed out the show is in demand among expatriates and many Pusswedilla DVDs are purchased for the purpose of giving gifts to Sri Lankans living abroad. He further pointed out the benefits of subscribing to a service such as SL Cast since the fee to watch a show will cost less than the price of a ticket to the live shows and access will be granted for a three-day period, within which viewers can enjoy their favourite Pusswedilla plays multiple times. SL Cast will also contain some free content such as Verbum Television. Verbum Television Ltd. Chairman R. Millan de Silva stated that this free access would be given to the real-time telecast of Verbum TV which as he pointed out is “Sri Lanka’s first and only catholic channel”. Content will include shows related to catholic religious observances as well as direct access to the Vatican and live telecasts of public addresses by the Pope. A few shows that are apart from the regular line-up of Verbatum TV will be made available on a pay-per-view basis for a nominal fee. Heritage TV is another channel that can be accessed on the new service. Heritage TV Managing Director Hema Nalin Karunaratne conveyed his joy on being a part of this group as it creates an opportunity to take Sri Lankan heritage around the world. Speaking on why the channel was given an English name Heritage as opposed to a Sinhala name Urumaya, he revealed that it had always been his goal to take the Sri Lankan heritage to global heights, since its inception seven years ago. “The reason was, and the number one aim was, to take the heritage to the world,” he explained. The service is not limited to TV channels as Wijeya Newspapers Ltd. Marketing Manager Digital Umair Wolid also discussed the availability of HI TV through SL Cast. He further added that this service would in the future also include video content from other newspapers in the Wijeya family such as the Daily Mirror. Talks are underway among the owners of content providers for the addition of new channels. SL cast will also soon introduce live telecasts of sports events and popular theatre plays to include expatriates and migrants in more events in Sri Lanka as they happen. They also hope to take this service one step further by providing private channels which will enable customers who wish to have their private functions such as weddings and birthdays privately streamed to friends and family abroad.